Christian Dior Miss Dior Blooming Bouquet is an amazing combination of audacity & youth. 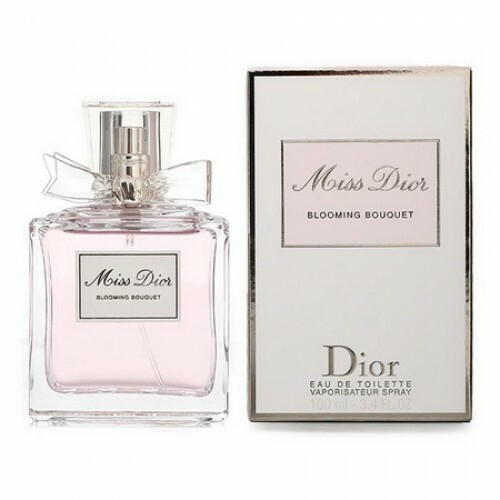 Christian Dior Miss Dior Blooming Bouquet EDT 100ml. - lighter and more recent version of the fragrance Miss Dior Blooming Bouquet by Christian Dior. The fragrance starts with fresh notes of mandarin essence. Flower "heart" is composed of peony and sensual "base" - of white musk. Aroma placed in elegant and graceful pink bottle with charming little bow. And the fragrance bottle and imbued with the spirit of innocent romance. Date fragrance: floral Top notes of mandarin essence note "Hearts": peony Base notes: white musk. light and delicate fragrance for fragile and sensual girls, is the embodiment of feminine elegance and sensuality. Its soft loop affects its freshness and brightness of purity, he seemed cool spring or the smell of youth. In the perfume with an elegant pink bottle design is dominated by notes of delectable white musk, patchouli, delicious Sicilian orange and luxurious peony flower and light notes of roses. Everything in it is permeated with romance. Flavor of love, flirting and smiles, it is lightweight, unobtrusive and even more aristocratic. It should smell so stylish and well-groomed girl. Fragrance Miss Dior Blooming Bouquet is a new interpretation of the classic fragrance Miss Dior, created in 1947, and marked the beginning of a new era in the world of fashion and style. Miss Dior Blooming Bouquet - it's an amazing combination of audacity and youth, unexpected and unforgettable: the spirits, which today determine the contemporary style of Christian Dior. This chic and "gourmet" flavor are sure to enjoy a fun and cheerful women, indifferent to the works of the legendary House of Dior.